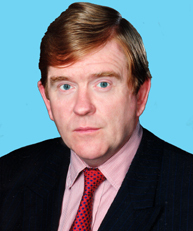 Since ex Flying Squad Commander John O’Connor took control of operations at CSTV he has had a hugely positive influence on the direction of the initiative and his years of experience have been invaluable as a source of knowledge and understanding of the issues involved. There’s much excitement among the young volunteers at his enquiring into the disappearance of Madeleine McCann in Portugal for example as was reported on TV. Obviously these enquires continue and the Commander will of course be keeping us all up to date with developments. John’s career with the Metropolitan Police Force spanned 30 years, operating in the Murder, Counterfeit Currency and Fraud Squads. Most of his service was spent in the Criminal Investigations Department (CID). John ran the Flying Squad at New Scotland Yard dealing with all armed robberies in London until retiring with the rank of Commander. Crimeshare Kids appreciate his sound advice to help keep them safe from predators so they nicknamed him ‘Commander Crimeshare’. He's looking forward to hearing from you. When I first heard about CSTV I was interested but as I learned more about it’s self help practical purpose I realised the value of the initiative for those who joined in not only helping themselves but their family and friends. The kids who get involved have my respect but I thought the best way to show my high regard for their work was to take part by offering my experience in support of their creative energy and I’m please to say together we’re making great progress. CSTV has had its setbacks but in the short while I’ve been involved I’m amazed how rapidly the Crimeshare Culture family is growing. Crimeshare kids could do with more support around the country so I decided to reach out to my colleagues of yesteryear and ask them to show respect for this new initiative and add to the generation mix of working in partnership for a safer, crime free future. We need the help of former police officers on the ground around the country to kick start the on-line Crimeshare Culture in their community. Close contact experienced eyes and ears to help direct operations locally and as a bonus to maintain a balanced approach to working in partnership in the community CSTV’s parent company the Triple A Multimedia Group will consider establishing satellite ‘Triple A Studios’ in the area for use by the kids to create constructive ‘hands on’ projects to cover a wide range of interests. This programme of self-help vocational training has proved to be hugely popular and very practical in leading to employment in the multi-media industries. In general it is accepted terrorism is now part of everyday life and the police need all the help they can get but people don't know how best to report their suspicions of possible terrorists living in their communities. CSTV gives them a local friendly means to share their information without embarrassment should their suspicions prove groundless because CSTV plan for each studio to be overwatched by local retired policemen to help evaluate the information. We contacted the Home Office advising them of our proposal and received an encouraging response from David Simmonds who is attached to the 'Respect Task Force'. 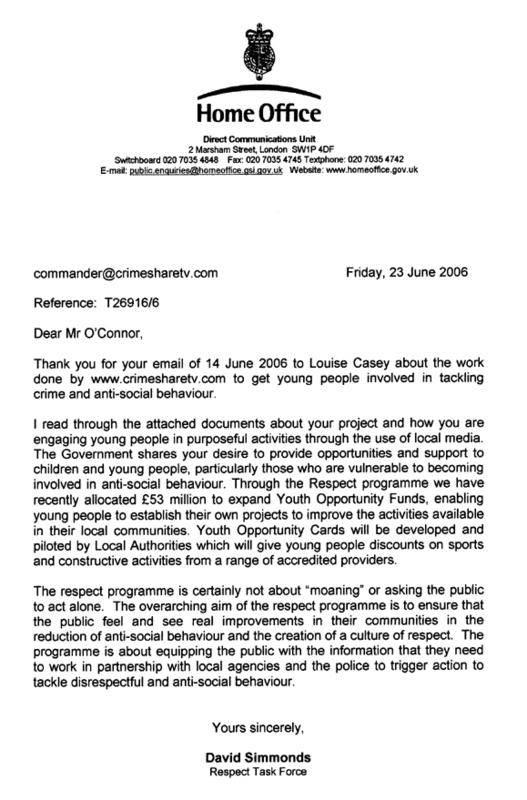 A copy of David's letter is below and we hope local authorities take full advantage of the funds available to kick start CrimeshareTV in their local communities, because the fight against terrorism and crime is everybody's responsibility. Interested! Get in touch - you will be very welcome.